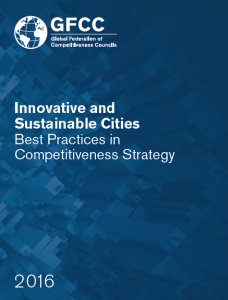 Best Practices in Competitiveness Strategy serves as a valuable tool for competitiveness councils around the world. It is an annual report featuring member testimonials, strategies and case studies highlighting the impact of these best practices. The GFCC intends Best Practices in Competitiveness Strategy to be not only informative, but enlightening. There are models to be copied in this report, and ideas to be tried. In this year’s report, we highlight outstanding examples of competitive cities in six countries from all parts of the world: Brazil, Canada, Ecuador, Korea, Saudi Arabia and the United States. 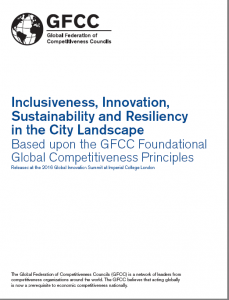 The GFCC Global Competitiveness Principles are the product of an annual and ever evolving assessment of what countries must do to contend in the global marketplace. Among other key elements, the document emphasizes the importance of innovation, intellectual property, skilled workforce, open and fair trade, natural resources productivity and transparent and smart regulations to economic growth. First released in 2010, the Global Competitiveness Principles have been refined and released every year to reflect the changing global economic environment and the themes highlighted in each GFCC Annual Meeting and Global Innovation Summit. Recognizing the growing relevance of cities and the importance of sustainability as a competitive advantage, this year’s GFCC Competitiveness Principles set forth policies to strengthen cities’ abilities to compete globally and, through that, create value and drive prosperity for all their citizens—at the local and national level. 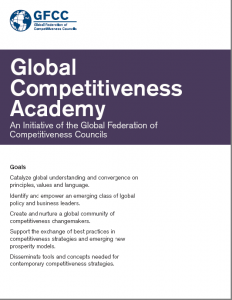 The Global Competitiveness Academy (GCA) is an action-oriented education and leadership development initiative that will create a new cadre of global leaders attuned to the drivers that underpin competitiveness. Participants will learn from the experiences and expertise of GFCC members and fellows in implementing competitiveness strategies and initiatives in their respective countries. 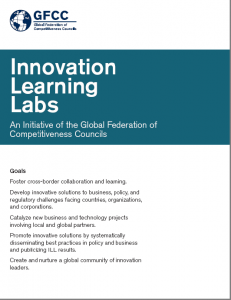 Innovation Learning Labs are progressive dialogues and intense workshops aimed at sparking participants to learn innovation promotion policies and initiatives and create new partnerships to boost innovation capacity and value creation. Core issues explored in the Innovation Learning Lab series include fundamental research, intellectual property, technology transfer, entrepreneurship, commercialization, public-private partnerships, funding, business acceleration, legal frameworks, and the overarching workforce and economic development environment across nations. 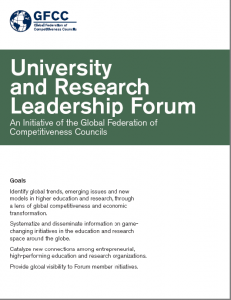 The GFCC University and Research Leadership Forum, comprised of university presidents and heads of research institutions, serves as a living think-tank to examine trends and generate ideas to optimize education and research enterprises. The GFCC works to develop a better understanding of the contributions made by global education and research institutions to innovation and competitiveness; facilitate new collaboration; and provide global visibility to relevant experiences and original thought in the field.